Litter pickers at the ready – there is still time to be part of the annual Big Spring Clean. Durham County Council has teamed up with LitterFree Durham and Darlington and Darlington Borough Council and calling on local residents, community groups, schools and businesses to organise litter picks to help tidy up their local areas. 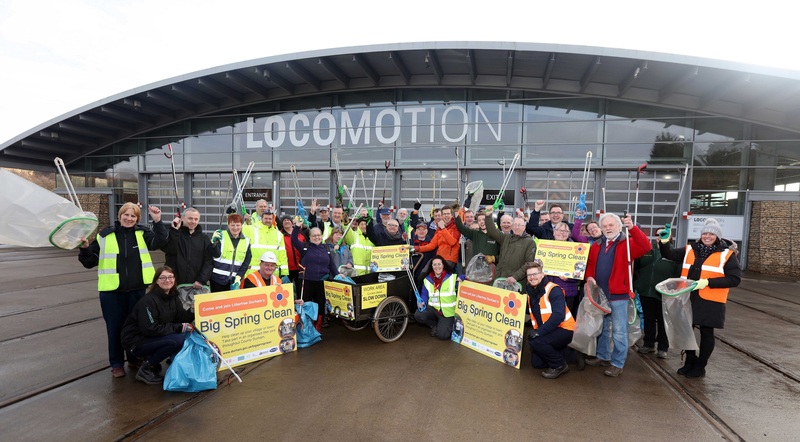 This year’s Big Spring Clean began in February at Locomotion Museum in Shildon, and will run up until Tuesday 9 April. Anyone who wishes to give their area a spring clean is being reminded it’s not too late to get involved in the annual litter-picking campaign. During last year’s campaign, 3,041 volunteers took part in 204 litter picks across County Durham, donating more than 5,267 hours of their time during which they collected 3,021 bags of rubbish. In the Darlington area, more than 1,090 people took part in 68 events, donating more than 1,150 hours of their time to clean up streets, parks and green spaces from which 1,102 bags of litter were collected. Cllr Brian Stephens, Durham County Council’s Cabinet member for neighbourhoods and local partnerships, said: “I would like to thank everyone who has volunteered so far and remind people that it’s not too late to sign up for this year’s Big Spring Clean and become a Litter Hero. To organise a litter pick in County Durham email litterfreedurham@durham.gov.uk or call 03000 26 0000. To register to help clean up an area in Darlington Borough, email litterfreedurham@darlington.gov.uk or call 01325 406719.